NBA 2K19 Screenshot - Kawhi Leonard (Overall Rating - 94) - Overrated, Underrated or Just Right? 2K released a new NBA 2K19 screenshot. This one featuring Kawhi Leonard, in his new Toronto Raptors uniform, with an overall 94 rating. Let us know what you think. The little faith I had is gone after this screen. Same exact body models with improved muscle tone and sweat. Tiny waist, short legs, no backside. Horrible. I talked about this over at the NLSC but I might as well post this here. I don't know if any of you have noticed this with all these released screenshots, but they're all the exact same. Over exaggerated sweat, under head shot hiding aspects of the stadiums and court textures. It's not even a coincidence anymore. Either they're trying to hide a big reveal that they've fixed every court in the game or that the game looks the exact same as 2K18. Same body types and everything from the looks of it. Personally I thought graphically 2K18 looked fine apart from the dark crowds, lack of body types, inaccurate textures (this is just the 2K norm at this point), but who knows maybe people won't be happy. Hopefully the fact that they've made barely made any changes graphically means that they've spent a bulk of the development time into the gameplay side of the game. Just realised there are actual different departments working on the game so it wouldn't really work like that. In that case the art development time should be put into the retro content or cyberfaces. Yeah you right, in that case it should be put it into other art aspects of the game such as retro teams or cyberfaces. Nah. We want player models fixed. They made shorter, skinny fit shorts and shortened the legs A LOT. It looks so much worse than 2k14 and last gen too. I’ll never get over how dumb they now look. 94 rating and only played 9 games last season and no indication that he's fully healthy/healed. Yeah ok.
look at difference in lower bodies. The same terrible body types, people complained about them in 2k18 before the game even came out and it looks like they're back. My expectations for this game are incredibly low. Yea. But not one body in 2k is accurate. If you get the avg height and weight of an nba player, and create a body it would look nothing like 2k’s. Basketball players have long limbs. How are their legs so short in 2k. Do you think they are accurate ? No. They’re professionals. The game makes a lot of money. We didn’t ask them to take one step forward, 2 steps back. Had they just tweaked shorts and player models from 14 we wouldn’t be complaining this much. Look at how much better these player models looked. Not the graphics/textures/jersey fit, just their proportions. They actually look like long lean pro basketball players. You guys used to complain about the 2K14 body types being too big and bulky though lol. 3rd image and still not impressed, I have PC mods from 2k18 that still look 1000x better!!! Shouders and arms definition are completely gone in 2K version. My expectation are going lower and lower after the last screenshoots posted by them (DM an KL). I was hoping for a new more accurated representation of body type but seems that nothing is changed from 18 version. Surprised that he got this high of a score with having played only like 6 games this year. That’s light years away from the point. It’s just odd when you look at DeMar who looks much improved but Kawhi and Donovan don’t seem to have the same definition. I said that in my post!!! Looks so weird seeing Kawhi in a Raptors jersey... Ok. It's pretty obvious that the models won't be changing much this year. The hips are too small and the arenas are dark. It does look off compared to real like. Point taken. You don't have to rehash the same gripes with every screenshot now. 2K14 has better waist areas. Other than that nothing on that game’s player models are better. 2K19 is most likely gonna be a minor upgrade graphically which is fine for me. I’d like them to address some of the graphical complaints of the community but most likely they won’t this gen.
With ld2k not working for them anymore I doubt any "devs" check this board anymore.The little waist thing doesn't bother me I never noticed it during gameplay but the super dark arenas is noticable..I think having this way let's them have really great looking player models,I think that's a engine thing not a artist choice. I mean 2k posts pictures of players with their ratings, people are going to comment ratings and how players look, I mean it's in the title, people are going to talk about the topic not the park or myteam. u can't be serious, 2k. leonard looks emaciated. Disappointed to see little to no upgrade to lighting and body types. I wonder if there is a possibility that they have implemented changes to all players yet because Giannis looked like a noticeable improvement to 2k18. Hope to at least see improvements to courts but not going to hold my breath. I've always been a gameplay first kind of guy though so I can look past visual short comings if I am having fun and enjoying the game. And I don't mean consciously making a decision to ignore issues with the visuals. If the gameplay is great I'll be too into the game to think waists look to skinny or shoulders aren't defined enough. Hell if I didn't come to OS I wouldn't even notice some of the things you guys point out. I'm either not that observant or don't look hard enough. This time of the year is always a good reminder to me of how far we've come in videogames. I remember being blown away in the early 2000s when player faces started looking accurate. I think it was 2k3 that impressed me because Kobe looked like Kobe and Paul Pierce looked like Paul Pierce. Here we are 15 years later talking about waist sizes, shoulders, skin tones, muscle definition etc. Many of you are right, 2k can and should do better, but sitting back and thinking about it all it's just like..this is where we are right now with a virtual simulation. It's no longer about just resembling real life, we are at a point where we want to replicate it to as close to 100% accuracy as possible. I'm basically over the look of the game I am just hoping that when in motion the game doesn't look and feel the same as 2k18 because I played 2k18 the least of any 2k game ever. apparently "official" drummond coming today/tomorrow based off ronnies tweets. some kind of huge 2k event where players will be given their ratings/screens but not sure if they can release them. If you guys go to the NBA 2K Reddit, they are taking feedback on player model issues for 2K19 and will be sending it to the art team. Also, does Kawhi have a new face scan? It's kinda hard to tell from that angle, but it looks better than his previous scan IMO. apparently "official" drummond, tatum, mitchell coming today/tomorrow based off ronnies tweets. So the Tatum and Mitchell pics that released earlier this week aren't official? Or am I reading this the wrong way? they are official and on the 2k twitter. NBA Players in LA this week for ESPY's or whatever, get at me. I got a big opportunity for y'all Thursday. And I'll hook you up with your rating/screen way early. Drop me a DM. ya the "thing/event" is today. no idea what it actually is other than players getting their 2k info for going. Wow...I still enjoy 2k18...2k17 was horrible though in my opinion. Not as heavily relied on defensively as advertised.... too small for Power Forward. How y’all gon rate him a 94 when he sat out most of his year and traded! Ok I totally dislike LeBron but y’all doing him dirty man he took over his whole team last year and he a 98 overall and kawahi sat out more than half of his year and he a 94?? ARE YALL CRAZY! Ratings are dictated by ON-COURT performance. Missing games consequently does not affect on-court performance. That isn't crazy. It's logic. They do look very dumb. I don't know how 2k approves it. He should be an 87 or something like that. After such a break and an injury like he had, he may not return just as good as he used to be. LOL, what injury was that? Reconstructive knee surgery? lol an 87 ? I got to know what attributes would you lower to make him an 87? If he was on the Lakers people would want him to be like a 75. It is not up to me to think what attibutes should be lowered. It is up to 2K. The fact is that 2k is rating Leonard as if he was still an active superstar player which is not the case at all. I highly doubt he will come back just as good as he was in his prime. It will probably take time for him to get back to his former self, if it happens, and this situation should definitely be taken into account when rating him in a game. He should be an 87 or an 88, not more than that in no way. I am also very curious to know what type of injury was that because he spent last season in rehabilitation and he barely played. It is certainly not serious, right? You're in the minority on this one. And that doesn't mean I am wrong. Being in the majority many times does not mean anything. Take the # 1 draft pick last year, Mr. Fultz. The guy is up to this point simply a bust and the majority was saying he should be a top draft pick. Rating Leonard as a 94 does not stand for itself. This isn't a nuanced argument worth disseminating, but sure I'll bite. Kawhi wasn't healthy and still played at his usual (top 5 player in the NBA) level. You are acting like he tore his Achilles or broke his leg (or that he didn't hold himself out after being medically cleared). He's 26 years old and the vast majority of his production comes from his skill and IQ rather than his athleticism. Paul George snapped his leg in half and is still largely the same player he was before the injury. Not that you should let precedent stand in the way of your tunnel vision. Discussing the merits of Markelle Fultz as a #1 pick in a weak class is a wee bit different from being in the literal 0.01% of people that think the Raptors downgraded swapping DeRozan for Kawhi. Great stats sheets, but I don't buy it. 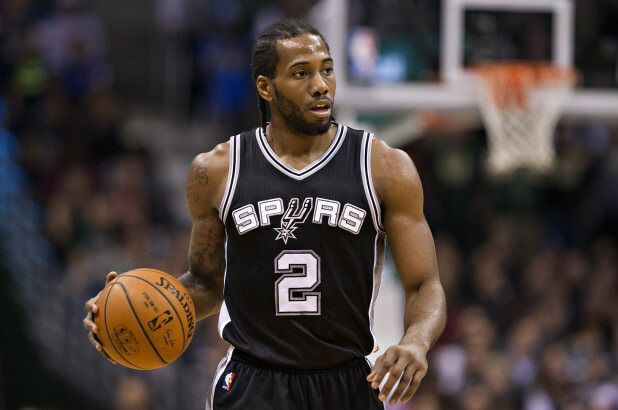 Still waiting for the season to begin and see if Leonard plays well. If he plays well, I am fine with him being a 94, a 95 or a 96 overall. Until then he should be an 88. That works the opposite way as well, you know? Kawhi has proven he's a top player in this league. If he comes out rusty or ends up not looking like his old self, then they can certainly decrease his ratings. Why would they make him worse than he was if he hasn't played any worse? That makes no sense. By that logic, they should lower everyone's ratings across the board since a lot of them haven't played all summer, and most haven't played since the regular season ended. If he plays poorly, then they can lower his rating. But until that happens, we should operate under the assumption that he will be the same on the court as he was before, as there is no evidence to the contrary. You can’t just say abracadabra make him an 87 . You gotta list specific attributes and stats to back up your claim. Alecast must be a spurs fan......lol. Crazy thing is, 2K gives us the power to go in and make Kawhi or whoever whatever rating we want. If we feel something should be lower we don’t have to edit the whole roster. Just go to Kawhi and change his attributes. He comes back not the same then 2K will drop a roster update showing that. Till then you have all the power to make him what you believe he is. It’s been mentioned a few times that play now online players do not have this power . Ahh ok. Well for the online players I’d assume that if he doesn’t play up to his old standard, an update will come out and his rating will be reduced. So either way it’s not a huge issue (for the people complaining). NBA 2K19 Screenshot - Donovan Mitchell (Overall Rating - 87) - Overrated, Underrated or Just Right? NBA 2K19 Screenshot - Ben Simmons (Overall Rating - 87) - Overrated, Underrated or Just Right?